This cult dates back to the 13th century, when a hunter from the village of Villamanrique (or Almonte, depending on which version of the story you follow) discovered a statue of the Virgin Mary in a tree trunk in the Doñana park. A chapel was built where the tree stood, and it became a place of pilgrimage. Devotion to this particular version of the Virgin was initially a local affair. 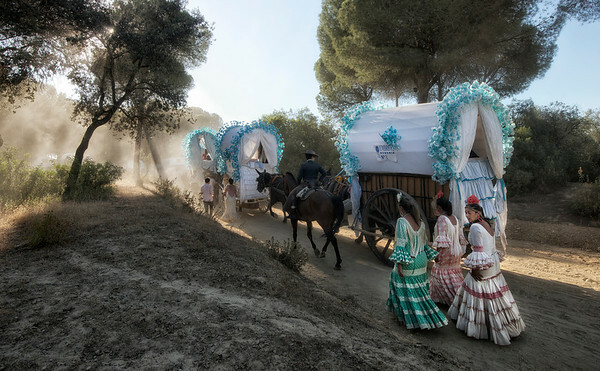 Then, by the 17th century, hermandades (brotherhoods) were making the trip from nearby towns at Pentecost; by the 19th century, they came from all over Huelva, Cadiz and Seville, on a journey taking up to four days. 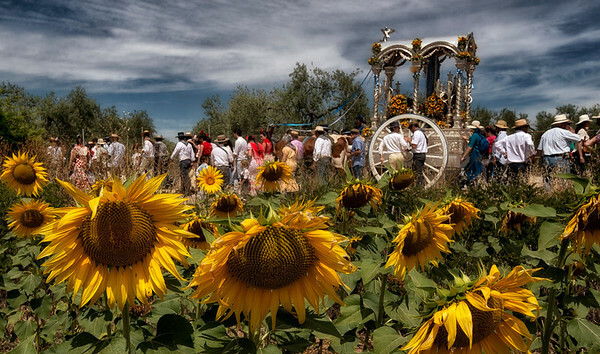 Over the next century, the cult of the Virgin del Rocio became more and more widespread, and these days participants come from as far away as Barcelona and the Canary Islands – not to mention tourists who travel from abroad, around Europe and even further afield. It is customary for the hermandades to stop at the town of Villamanrique. 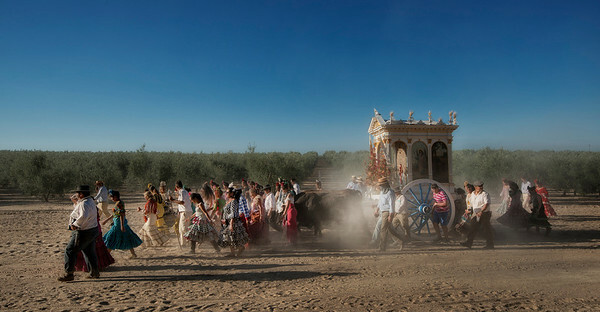 Oxen are then made to pull the cart carrying the image of the Holy Virgin up a staircase to the entrance of the local church “pictured above” and receive a blessing from the priest. A pilgrim takes a rest in the famous “Vado del Quema” river, were it is customary for first time pilgrims to get baptised as “Rocieros”. The town of El Rocío is a sprawling, pretty Wild-West-style place (you tie your horse to a wooden rail with a sign saying “Reservado Caballos” – reserved for horses – while you have a drink or a meal), with sandy, unpaved roads (easier on the hooves). 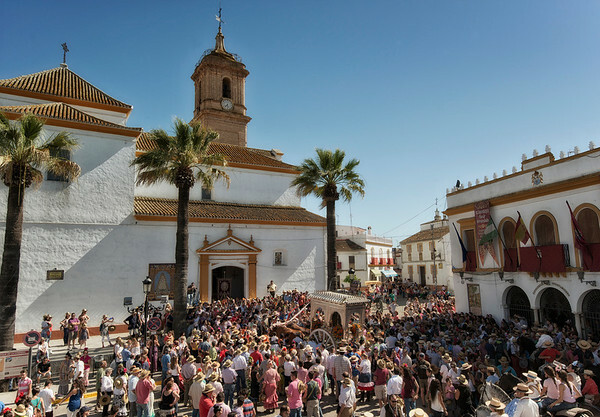 For a few days in late May or early June, Catholic hermandades (brotherhoods) and countless others flock from all over Andalucia, Spain, and beyond, to the town, to pay tribute to the Virgin del Roció, housed in her own church in the town. The pilgrimage takes place over the weekend before Pentecost Monday, the seventh weekend after Easter (7th – 9th June 2014). People start arriving on the Friday before, and leave again on Tuesday.. The actual pilgrims don’t travel on the motorway itself, but follow a route which sometimes goes alongside it – the queue of horses and wagons, surrounded by clouds of dust snakes back for miles. With Spring in the air, dancing and singing around campfires and the romance of travelling by horse and carriage it’s little wonder that so many Rocieros are actually “Made In El Rocio”. This couple take an intimate moment behind a a wagon away from the travelling troop. HOW DO THEY GET THERE, AND WHAT HAPPENS ON THE WAY? 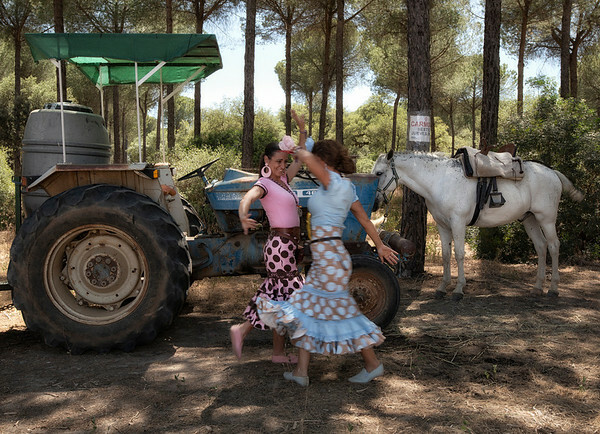 Every late May, or early June, in villages and cities across Andalucia (especially the western part), you can see the locals gear up their covered wagons and don traditional Andalucian clothing – broad-brimmed hats and traje corto for men (grey, brown or black trousers, often with Western-style leather chaps, and boots), and flamenco dresses for women – a slightly different style, with a fuller skirt than the fitted Feria dresses – to head off to the El Roció shrine, accompanied by their own virgin on her simpecado (float). 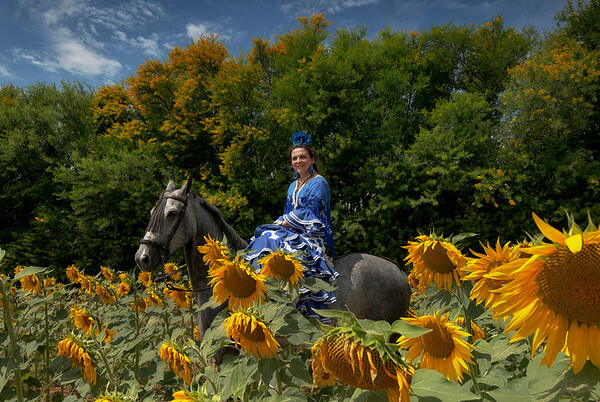 Some still make the journey the traditional way, on horseback, or in picturesque gypsy-style covered wagons (reminiscent of the Wild West), adorned with flowers (either real or imitation), with curtains tied back, offering a glimpse of the interior. These are pulled by pairs of oxen, whose yokes have decorated leather headpieces, and bells hanging round their necks. It is a spectacular sight – one not to be missed if you are in the area (especially Western Andalucia) that week. 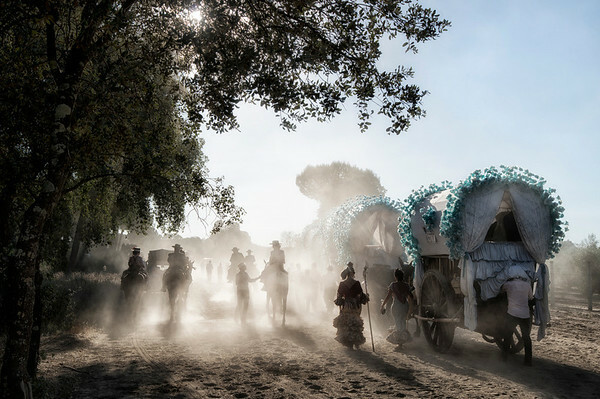 In Seville, for example, groups of horse-riders (men are called jinetes, women amazonas) and processions of gypsy caravans from the Seville brotherhoods, gather by the cathedral on the Wednesday morning before, as they prepare to set off on their pilgrimage to El Rocio. They return the following Wednesday. Other hermandades leave from all over Andalucia, earlier in the week. 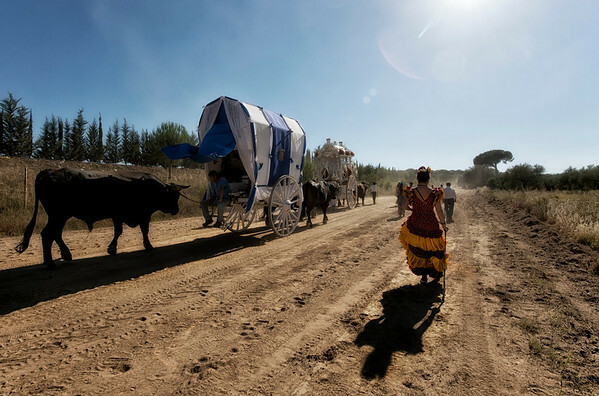 A travelling troop brave the heat of the afternoon sun and dust on there way through the Doñana national park..
Everyone sings rocieras (flamenco-style songs about the pilgrimage) as they travel, and again at night around the campfire when the hermandades have stopped to eat, drink and dance and make merry, accompanied by plenty of wine. 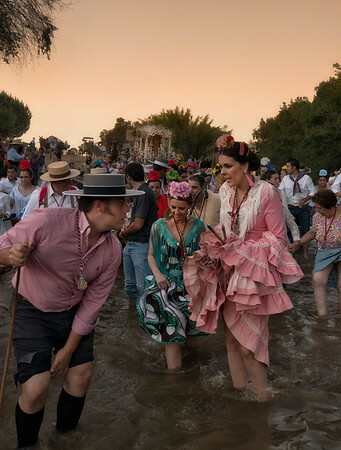 It is alleged by some that the annual baby boom which happens nine months after El Rocio always includes offspring produced as a result of extra-marital dalliances. People also travel in big trailers pulled by tractors, ideally with shade as it can get very hot, as well as lots of food and drink. 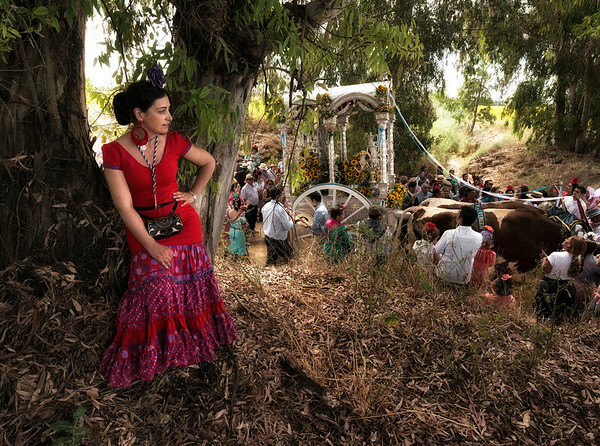 The rocieros sit on benches along the sides of the trailers, including many children who go on the pilgrimage every year. The more practical and comfortable, though less attractive, option is a big white caravan, with the same curved roof as the traditional models, complete with air-con and running water. This is pulled by a 4×4, as the route takes rocieros through the Doñana park, including several river crossings, so a tough vehicle is essential. WHAT HAPPENS WHEN THE VIRGIN MAKES HER APPEARANCE? In the early hours of Pentecost Monday, the Virgin is brought out of her church by the Almonte hermandad, who claim her as their own. A tussle ensues between the various other brotherhoods for the honour of carrying her to the next chapel, and so she journeys around the town, visiting all the hermandades’ chapels, for the rest of the day. Popularly known as La Paloma Blanca (the White Dove), she is an object of massive veneration in Andalucia, and huge crowds push and shove just to get the chance to touch the glass case in which the Virgin sits, as she sways dangerously from side to side. People even lift small babies up to touch her. This remarkable, chaotic event is always televised by Canal Sur, the Andalucian regional TV station. 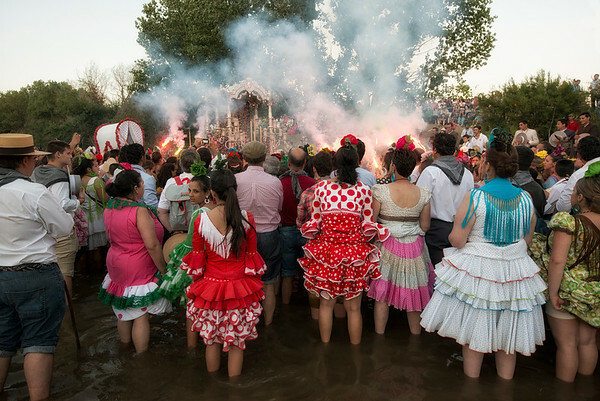 Apart from being the place of baptism for first time pilgrims the river “Vado del Quema” is also the place to stop for a rest, soothe weary feet in the cool water and sing traditional “sevillanas” to the holy mother.